Suitable for all breeds from 6 weeks old. For younger puppies use Nutriment Weaning Formula. Enhanced natural raw feeding supplies essential proteins, amino acids, fatty acids, vitamins and minerals needed for dogs to thrive throughout their lives. *Higher in fat and protein to aid growth - recommended until 6 months old. *Finer grind of bone - perfect for the smallest of puppies from 6 weeks old. *Easy to digest protein. Contains 90% British meat, offal and bone. 10% vegetables, fruit and natural super foods. Just check out the other ingredients! Once the puppy has been weaned, start by feeding 4-6% of the puppy's ideal body weight per day, ideally spread over three or four meals per day. Once the puppy reaches around 5-6 months of age, you may reduce the number of feeds to twice per day, and gradually reduce the amount to be fed to around 2-3% by the time the dog has achieved full size. 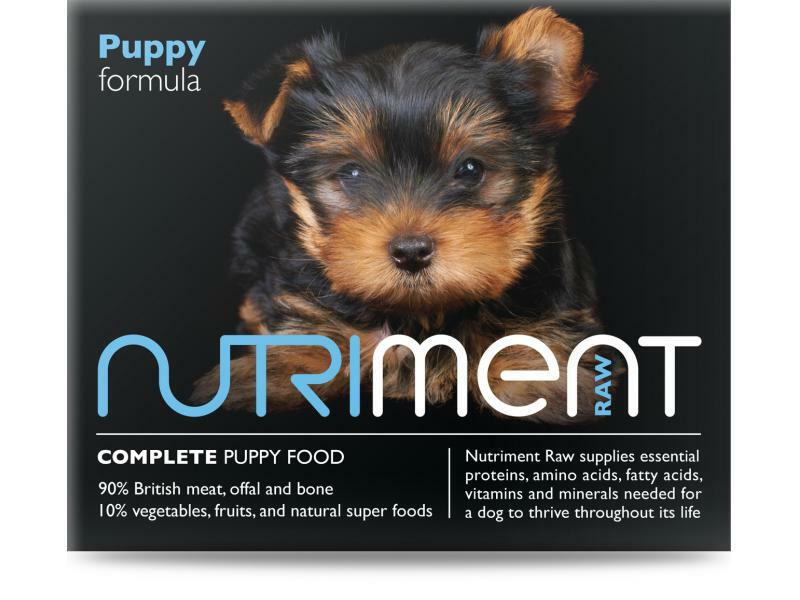 There are currently no questions for Nutriment Raw Complete Puppy Formula - be the first to ask one!